Assam: With Gunotsav approaching, classes being held for first time in several Karbi Anglong schools! In Gunotsav 2018 (Second Round), West Karbi Anglong is one of the districts that are being covered in Phase II among 17 districts. There is “sudden activities” in the primary schools in West Karbi Anglong with Gunotsav coming up. 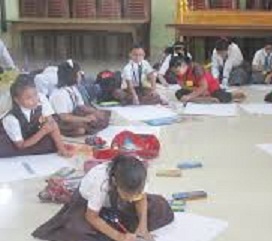 Classes are being held reportedly in few primary schools in Karbi Anglong for the first time in many years. One such school is the Vo-Terang Langso Lower Primary (LP) School in the village that bears the same name under Socheng Education Block in Amreng Member of Autonomous Council (MAC) constituency. Although the school has its own building but that is all about it, no midday meal for its students, not enough furniture, no free uniform, no power and above all no teachers! The villagers have pleaded to the Socheng Education Block authorities repeatedly to provide the said facilities to the school but to no avail. Left with no alternative, the villagers have nominated a youth Bright Hanse to teach the children. Hanse has been teaching the students for the last two years. It is reported that the concerned education block, Karbi Anglong Autonomous Council (KAAC) authorities along with the numerous students’ organisations in the district has turned a Nelson’s eye towards the school. A guest teacher has been brought in from Charchim LP School for teaching the students in Vo-Terang LP School because in the next few days Gunotsav is starting – from October 31 next. West Karbi Anglong will be covered by Gunotsav 2018 (Second Round), Phase II from October 31 to November 3 next. The other districts are Baksa, Barpeta, Biswanath, Chirang, Darrang, Dhubri, Dima Hasao, Goalpara, Golaghat, Hailakandi, Kamrup (Metro), Karimganj, Lakhimpur, Majuli, Nagaon and Tinsukia.